For a complete (detailed) trip report you may click here. This mountain is a serious undertaking. 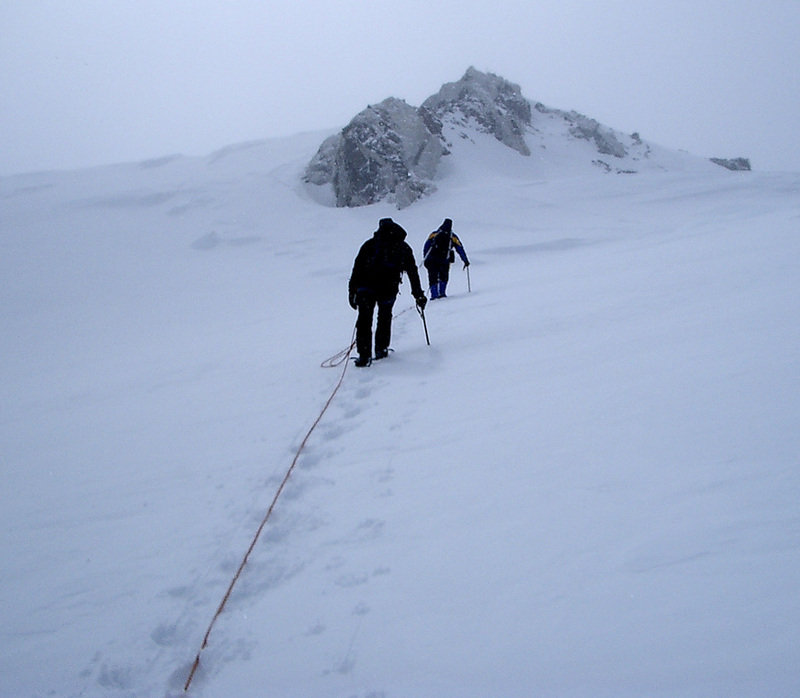 There is no single, very difficult point on the route, but its size, the elevation, the northern location, the unpredictable (bad) weather, all combine to make this an overall challenging and difficult objective. Any party attempting the peak should be well trained in (harsh) winter conditions and well prepared for a physical as well as mental challenge that could last three weeks. 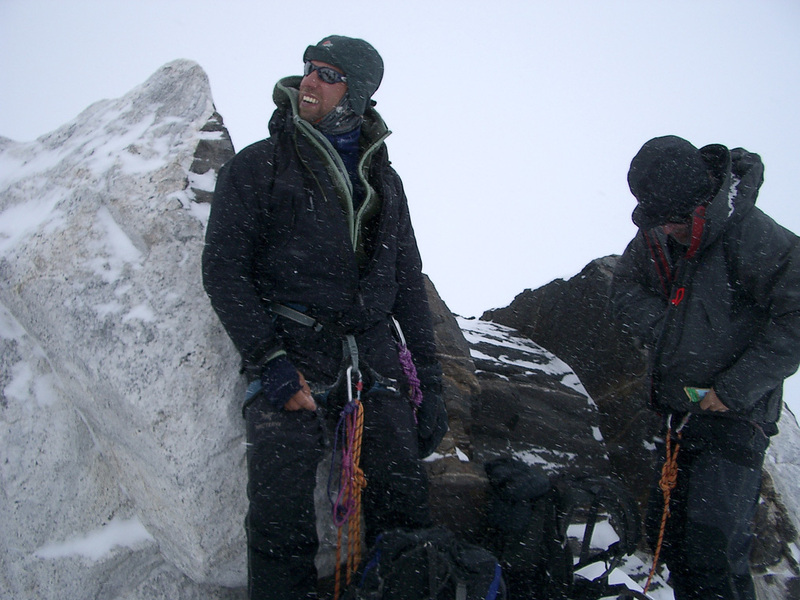 In 2006 the climbing permit cost US $ 200. 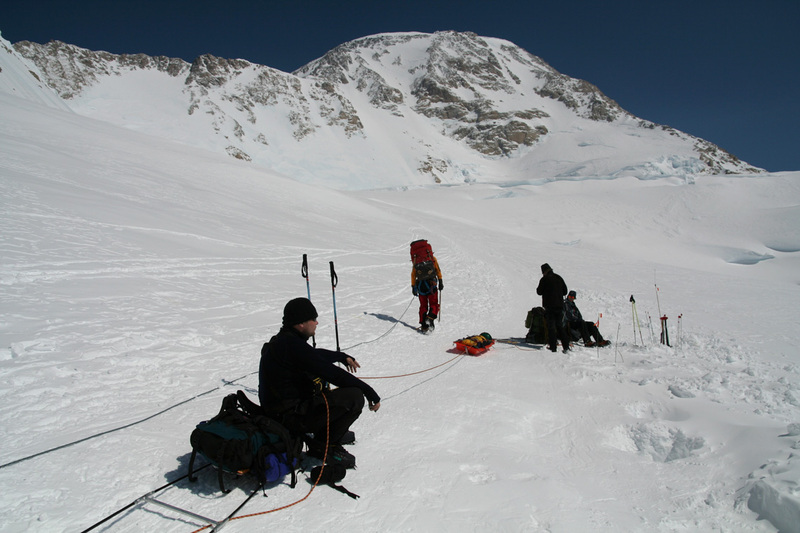 One must apply for a permit at least 60 days before the intended climb. All climbers must check in before the climb with the ranger station (National Park Service) in the small village of Talkeetna. 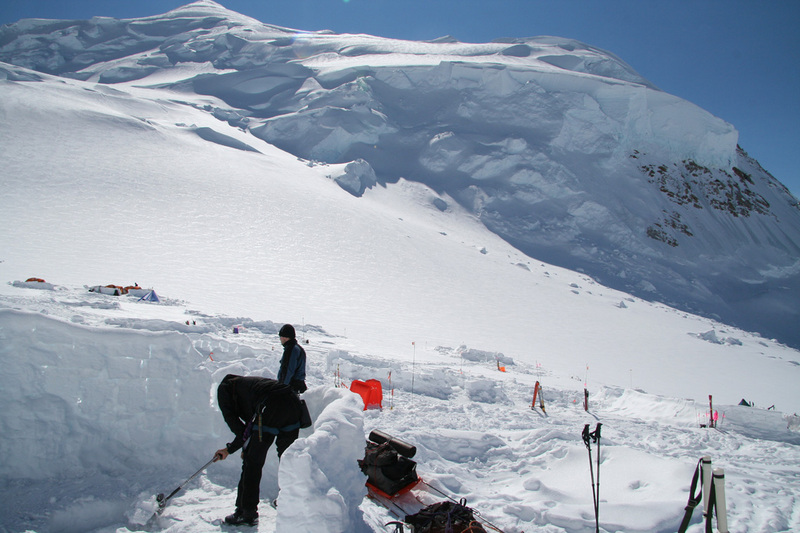 Similarly, all climbers must check out of the park after their climb at the same location. From Europe, a flight to Seattle in Washington with connection to Anchorage in Alaska is a possible choice. SAS flies daily between Copenhagen and Seattle, while Alaska Airlines has frequent flights onwards to Anchorage. 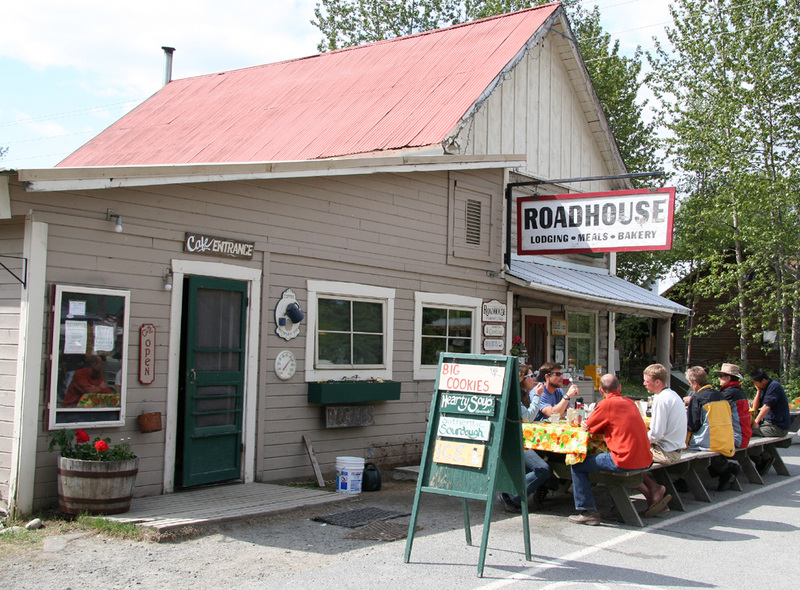 Many climbers headed for Denali have stayed at Earth Bed and Breakfast in transit to Talkeetna and so did we. 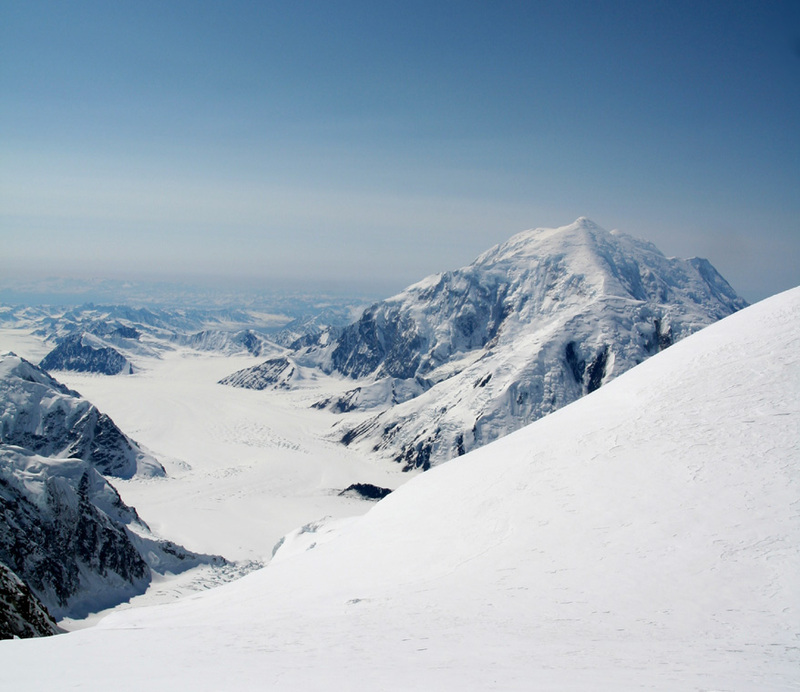 There is a convenient shuttle service (van) that provide climbers with transportation between Anchorage and the village of Talkeetna. 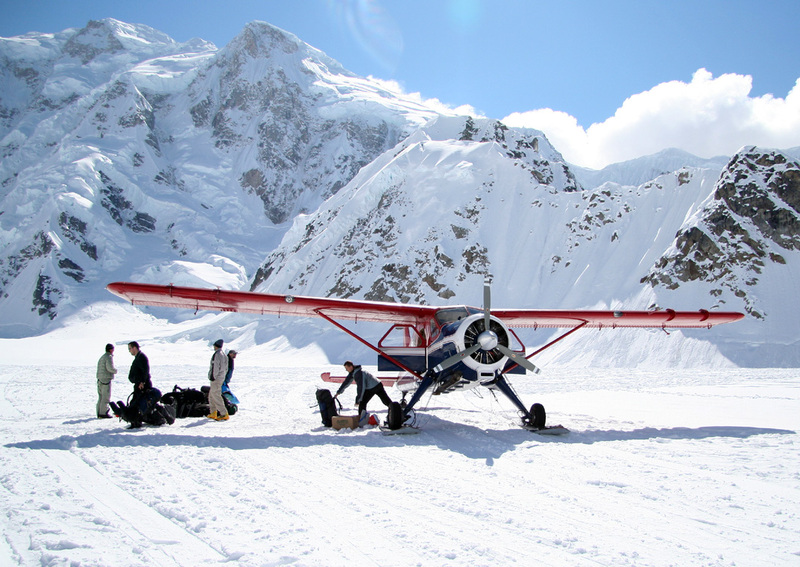 From Talkeetna to the South Fork of the Kahiltna Glacier Base Camp, one needs to fly. 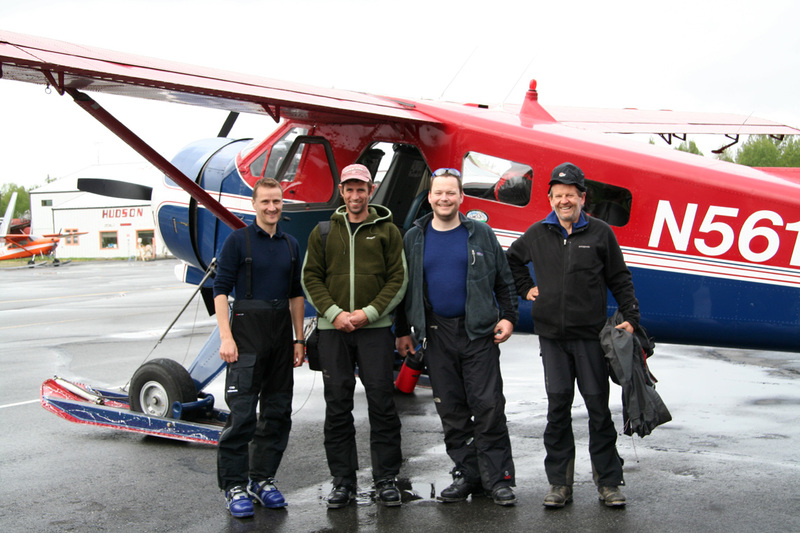 There are several flight operators in Talkeetna, we were quite happy with TAT - Talkeetna Air Taxi. You may also view our climb using Google Maps. 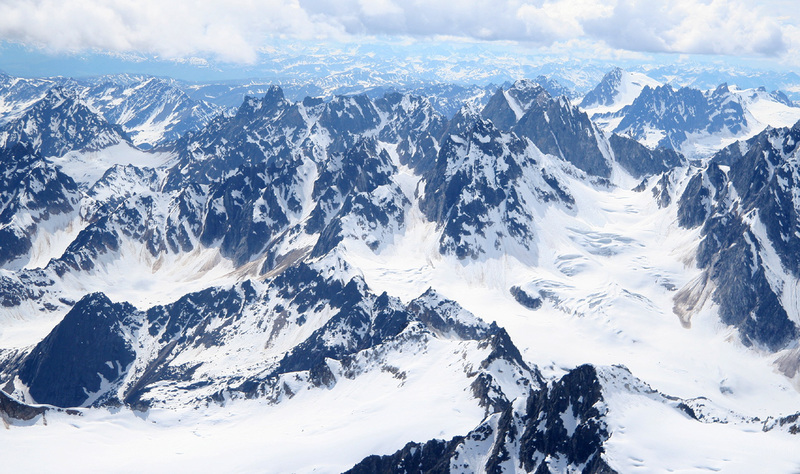 Day 1: We flew a Beaver ski plane from Talkeetna to the South Fork of the Kathiltna Glacier. 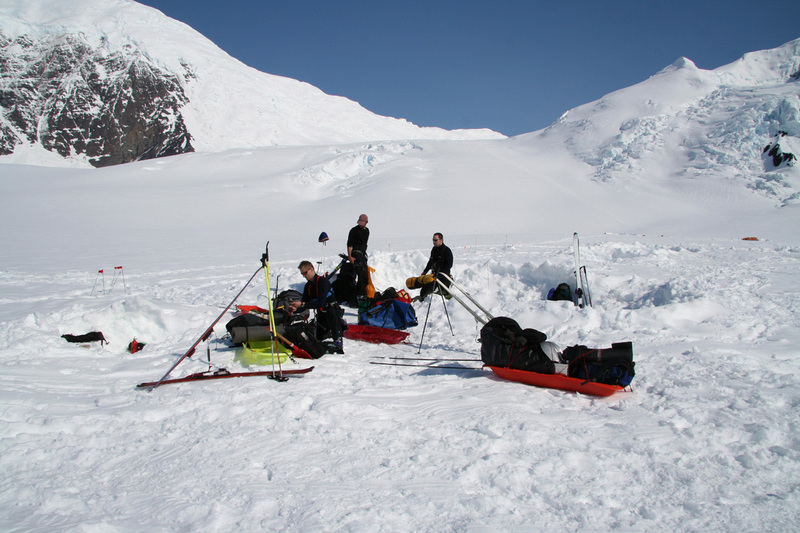 This is called Base Camp for the Denali climb. 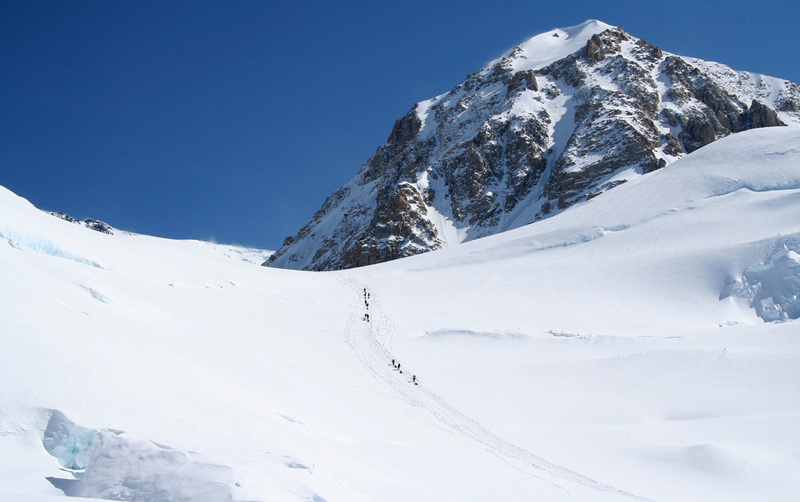 We immediately skied to Ski Hill Camp (2338 m), located just below the first significant hill, called "Ski Hill". 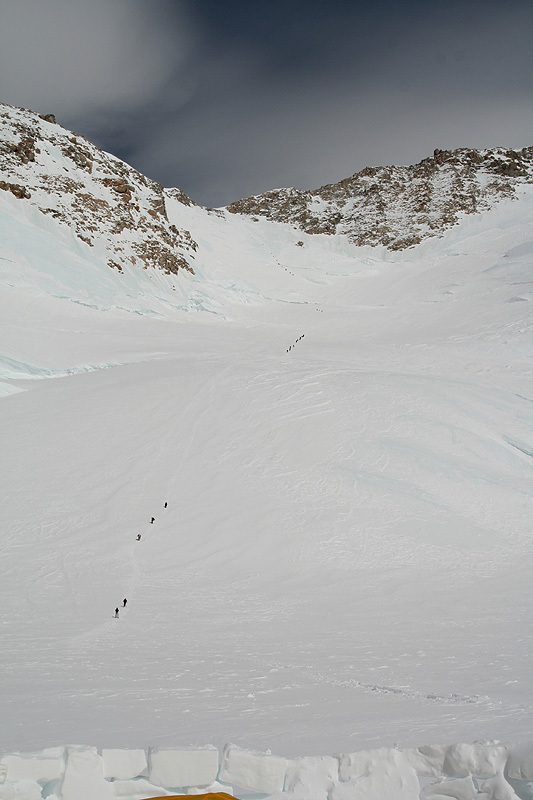 Day 2: We continued up Ski Hill and camped at elevation 2973 m, (N63:04.079, W151:10.608). 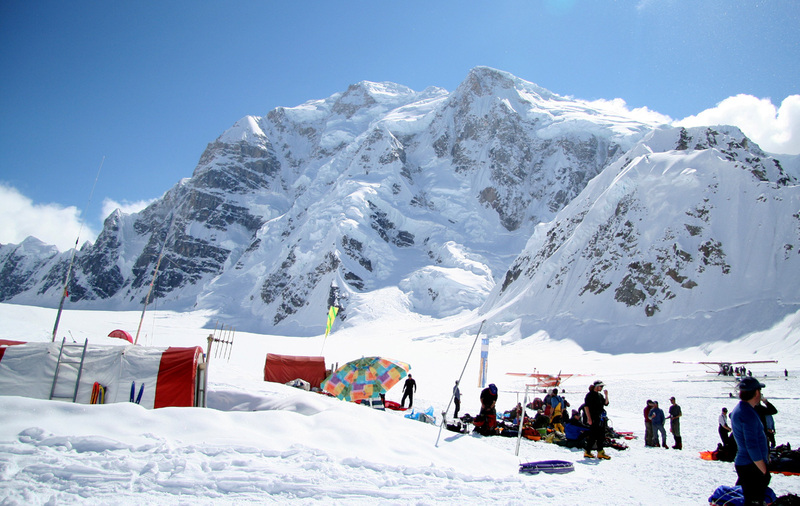 Day 3: We skied up to Motorcycle Hill Camp (3373 m), located just below "Motorcycle Hill". 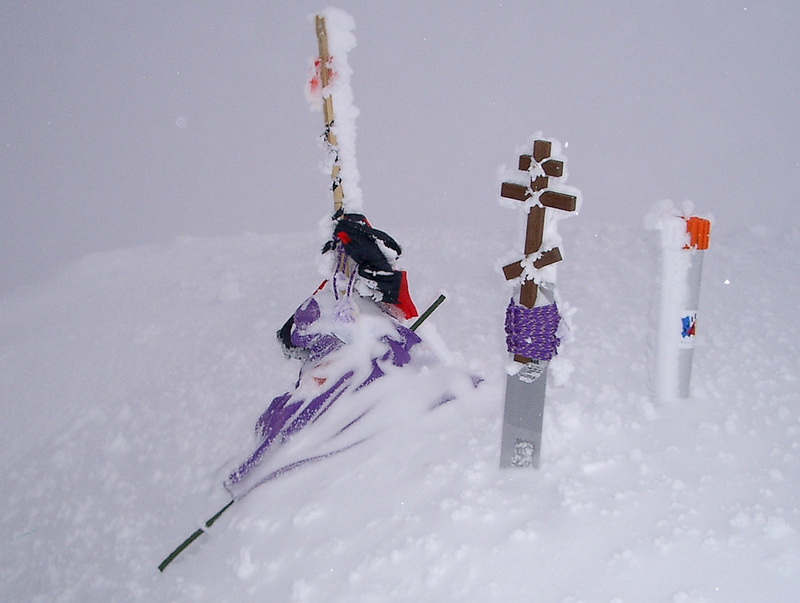 Day 4: We walked up past "Windy Corner" and left a cache of supplies there (4119 m). Then returned back down to Motorcycle Hill Camp. 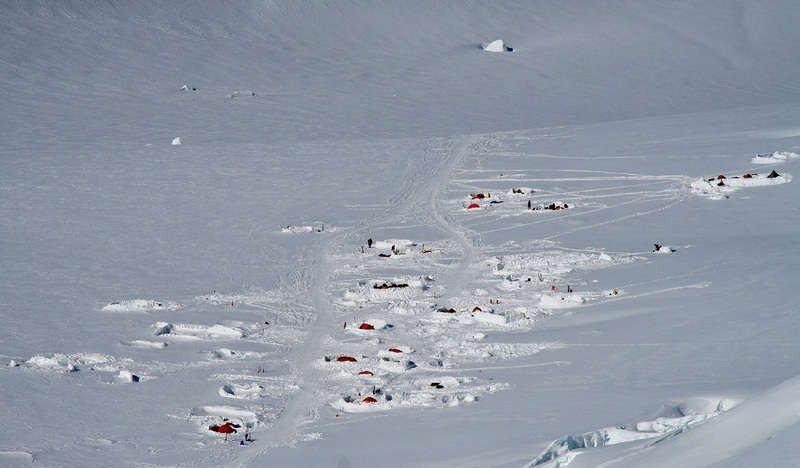 Day 5: We left a cache of equipment that would not be needed higher up, in particular our skis, at this Camp, then walked up to Basin Camp (4346 m), also called "Medical Camp", "Advanced Base Camp", etc. Day 6: We walked back down near Windy Corner, retrieved the cache left there on Day 4 and carried this up to Basin Camp. 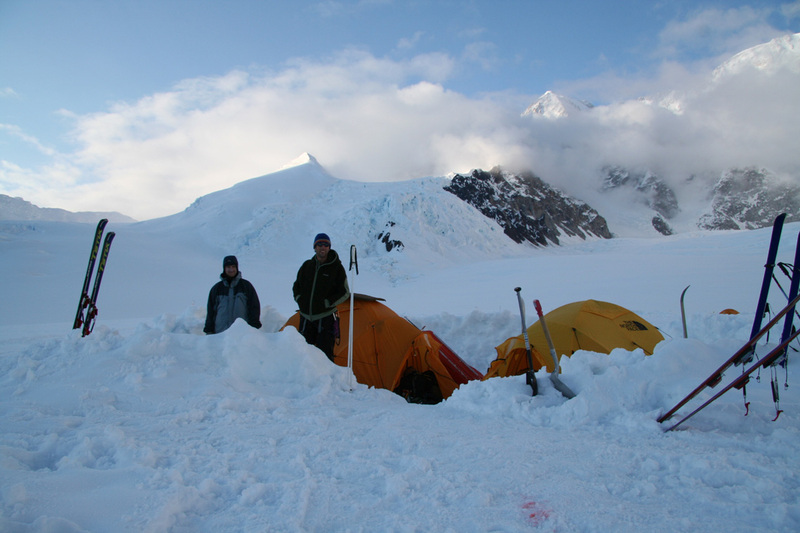 Day 7: We did acclimatization in Basin Camp. This included a hike up to the lower end of the Headwall. The weather was too windy. Day 8: We stayed in Basin Camp due to bad weather. Day 9: We stayed in Basin Camp due to bad weather. 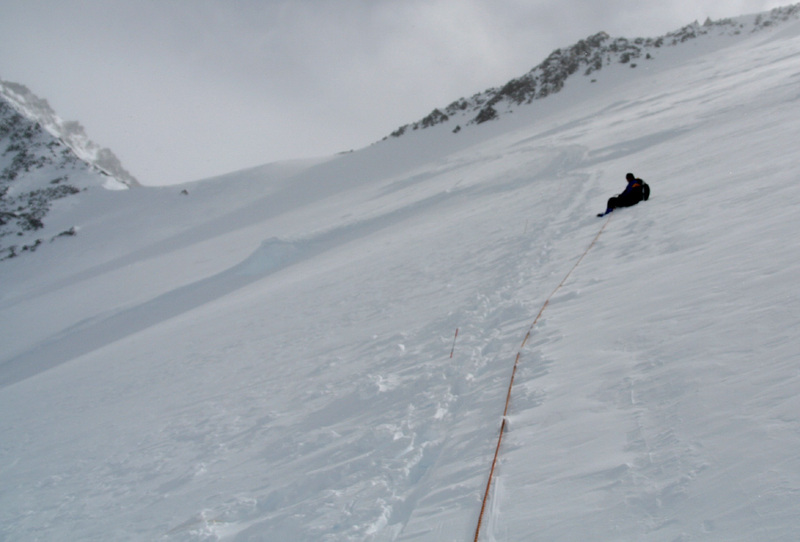 Day 10: We carried supplies to the top of the Headwall and cached it there on the West Buttress (4949 m). The wind was full storm force on the Buttress ridge. 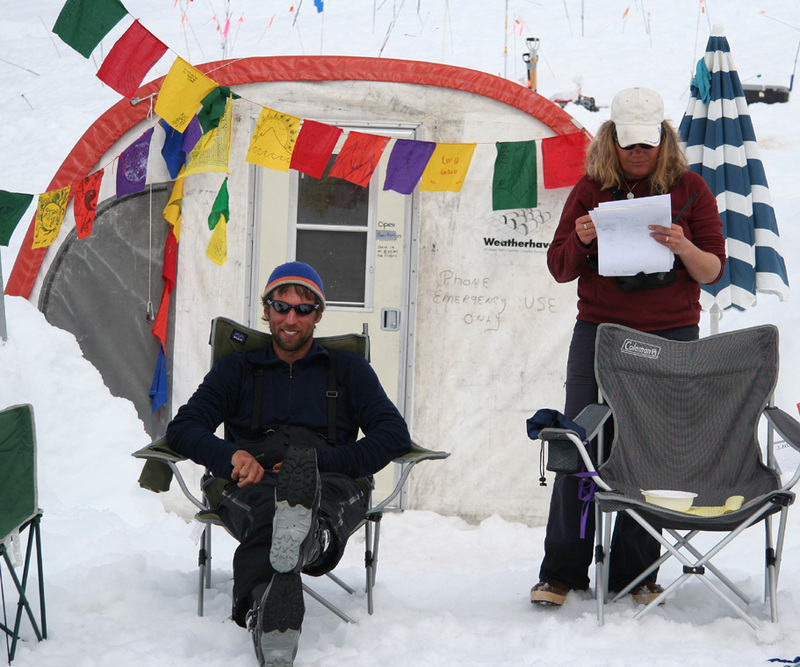 Day 11: Rest and acclimatization in Basin Camp. The weather was not good. 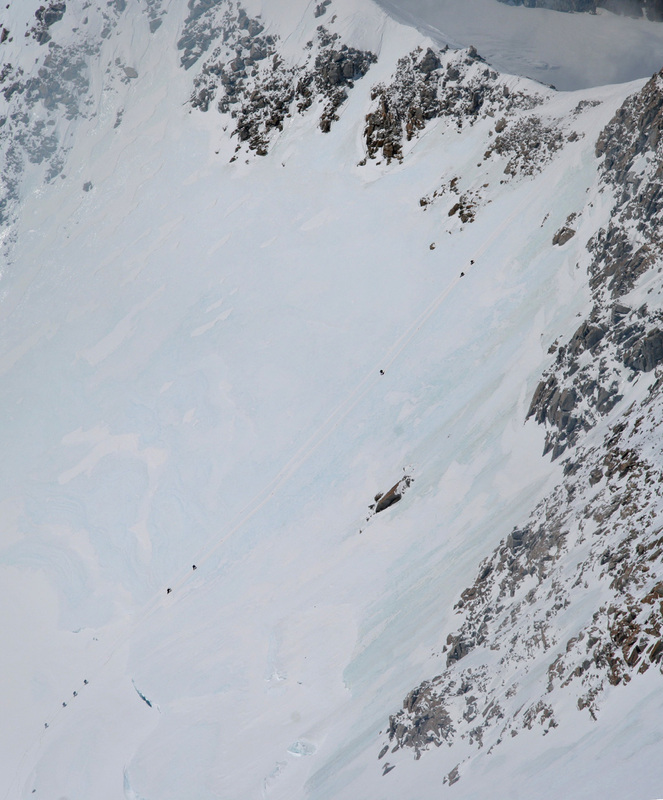 Day 12: We climbed from Basin Camp to High Camp (5259 m) via the Headwall and the West Buttress. 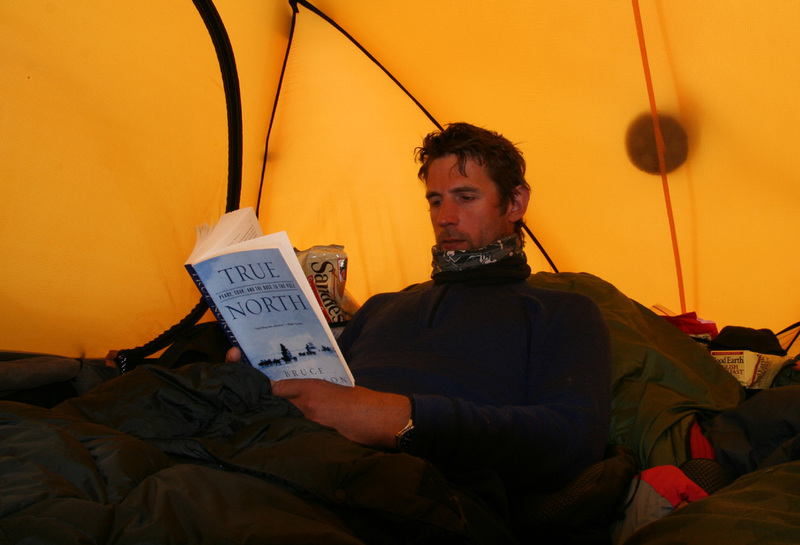 Day 13: Acclimatization and rest in High Camp. Day 14: Summit Day. We started at 0830, had to break trail in deep snow. The weather turned windy and marginal. 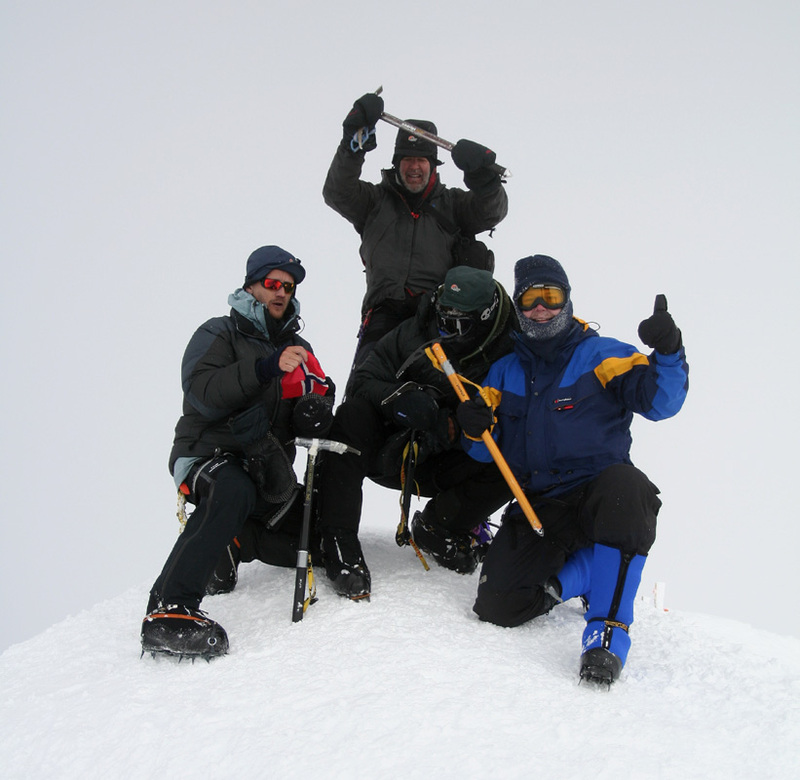 The team had a tough time and reached the summit at 1920. 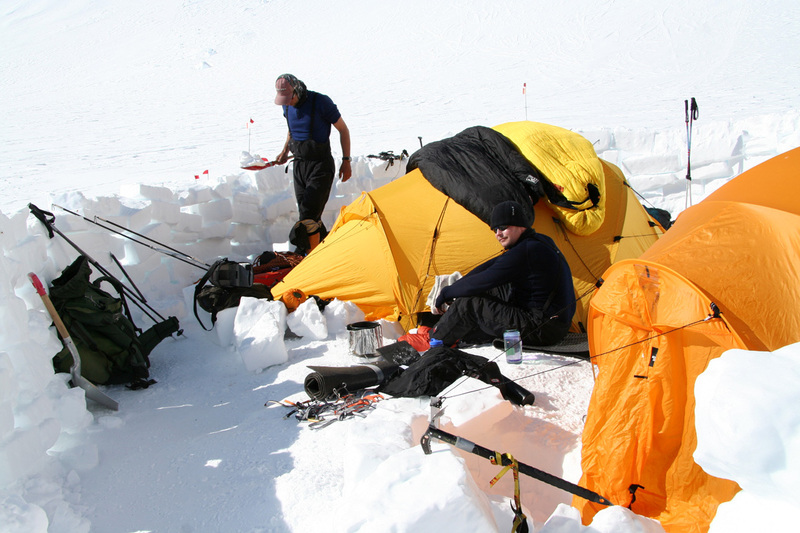 We returned to high camp at 0100, almost 15 hours - a solid effort given the circumstances. 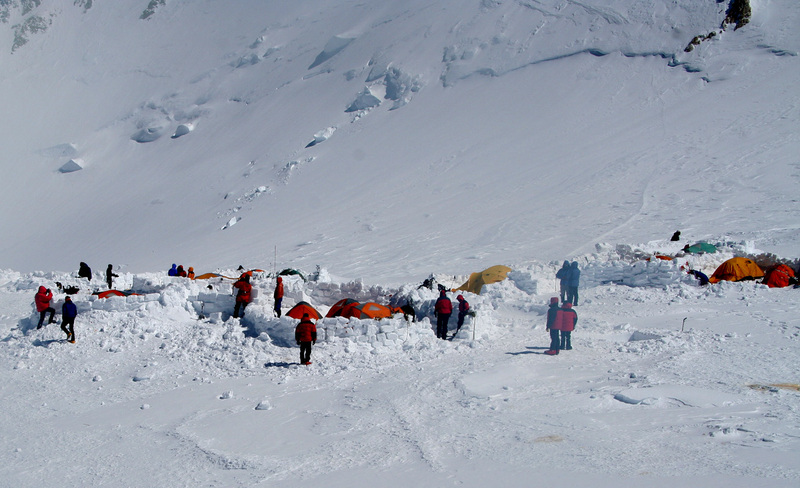 Day 15: We relaxed in High Camp, then climbed down to Basin Camp in the afternoon. 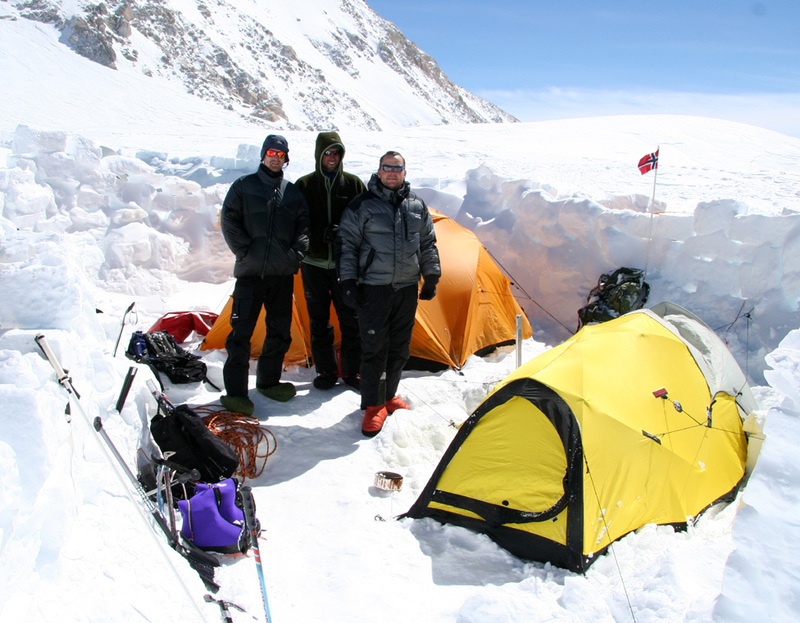 Day 16: We hiked and skied down to Base Camp. Day 17: We flew out back to Talkeetna. 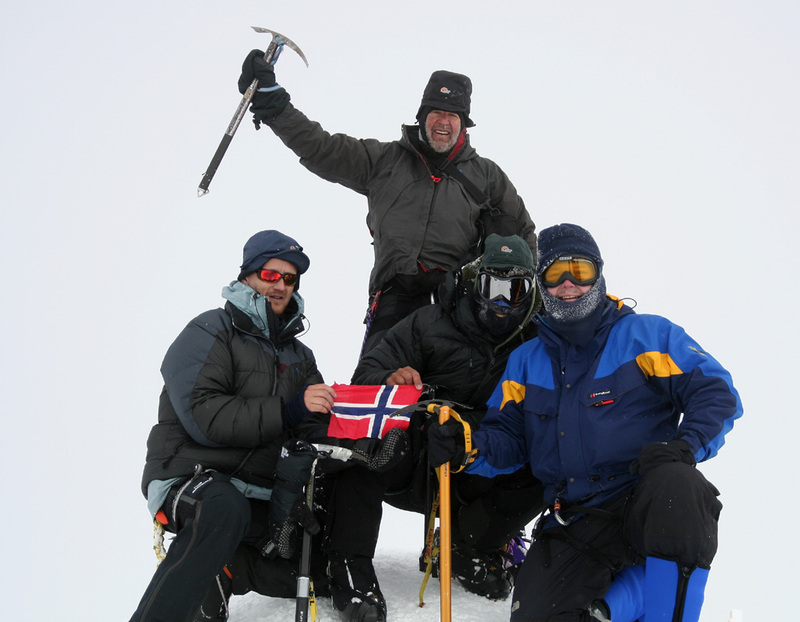 Comments: I did this most memorable climb with a team consisting of Jan-Frode Myklebust age 31, Olav Glosli age 36, and Helge Larsen age 41. 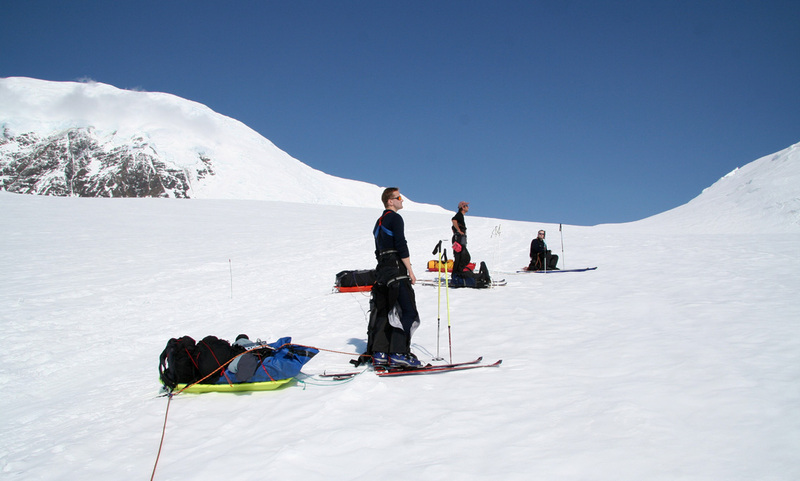 I organized this expedition as a completely private trip. No outside assitance was required. 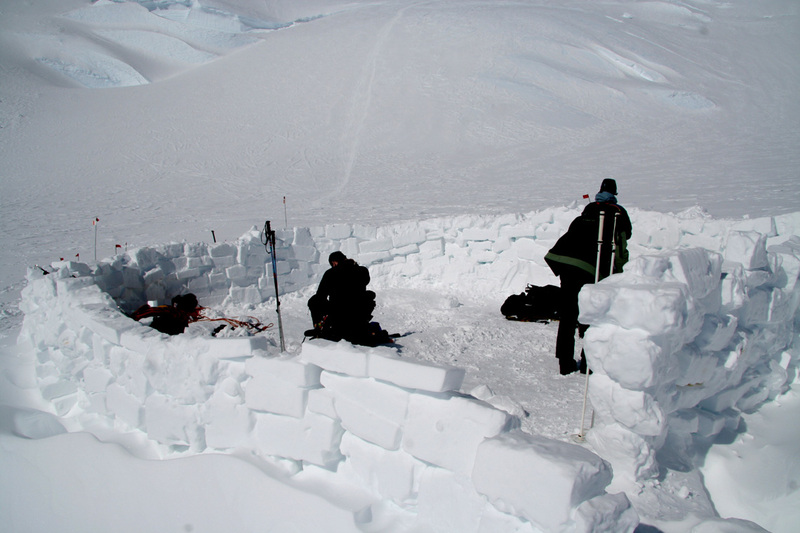 Preparations, starting with getting a team organized started about 3 months prior to departure. We collected some medical information every morning in order to monitor acclimatization and be able to take the necessary precautions if any member should show symptons of altitude sickness (AMS). 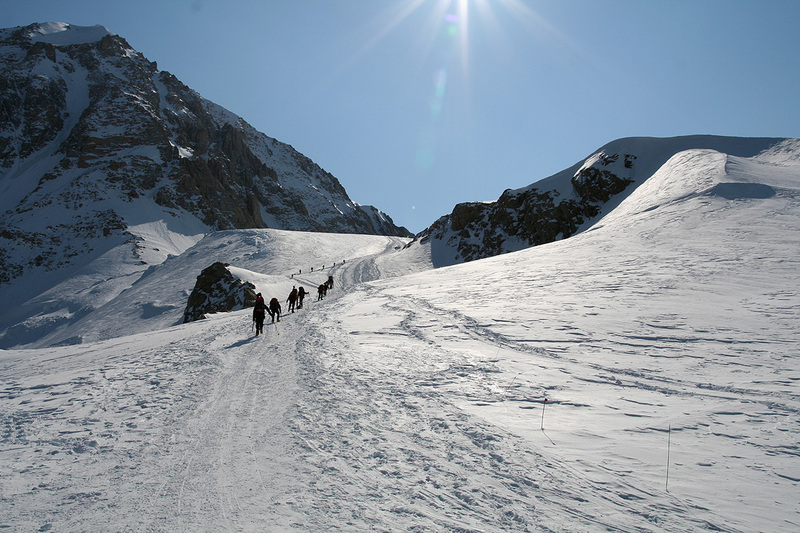 Detailed information of the route by way of GPS measurements are also available. 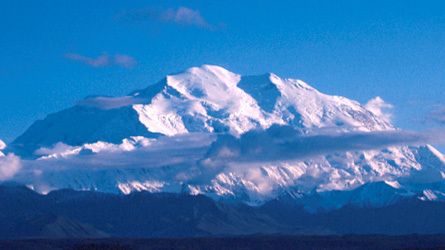 Denali, as seen from Wonder Lake, September 1981 (the north side).